Stretching over some 400 square kilometres of forested area, the legendary Angkor Archaeological Park, UNESCO World Heritage since 1992, is one of the most important sites in Southeast Asia. It contains the magnificent remains of several capitals of the 9th till 15th centuries Khmer Empire: featuring the temples of Angkor Wat and Bayon. The symbolic structures of the temple-mountain Hindu concept represents the mythical Mount Meru: surrounded by moats, shaped like pyramids and topped by precisely five towers, representing the 5 peaks of Mount Meru. The Baray (water reservoirs) surrounding Angkor were used for irrigation; though some historians argue that their primary function was political or religious. Describing the rich Angkor Archaeological Park needs a perfect acknowledgment of History, architecture, tradition and religion, which we delegate to the excellent websites published on the matter: “Angkor Road”, and the UNESCO Angkor homepage. November to February is the ideal season to visit Angkor, with a dry and cool weather (25-30°C). Just expect lots of tourists... and higher hotel rates. We like to stay there in April-May (avoiding mass tourism), and never suffered from the premise of the hot season (when temperature reaches 40°C). Avoid June to October, when the rainy season turns outlying temples and the roads leading to them into quagmires of mud. You may come directly to Siem Reap by air with Bangkok Airways (check our in-flight review of this expensive though good “boutique airlines”) from Bangkok, or by the the low cost Air Asia: flying from plenty of destinations in Asia, and all countries from Southeast Asia, it has direct routes to Siem Reap from/to Kuala Lumpur and China (Chengdu and Hanghzou). It also flies to Phnom Penh from/to much more destinations. We like Air Asia, as it is good value for money and extremely reliable in term of schedule and security. Though they employ young, kind, highly motivated and efficient staff, they still have one major problem: don't expect any compensation from them if they break, delay or simply lose your luggage. Which happens quite often (at least flying from Bangkok): we unfortunately experienced it for you... Make sure that you make use of your Gold, Platinum or Black credit card upon Internet booking, and keep cool: the card insurance will compensate efficiently and quickly, and you will not have to battle in vain against Air Asia... Jet Star Asia, Cambodia Angkor Air, China Southern and Vietnam Airlines are now flying to the more and more active Siem Reap International Airport. Those coming from Phnom Penh won't travel by railways (no passengers trains in Cambodia), but either by air, taxi (very cheap; but local roads are too dangerous to risk one's precious life in a old Japanese sedan car...) or by bus. Be careful, as there is only very few safe companies: the best -with few if none accidents- is Giant Ibis. Just make sure to book at least a couple of weeks in advance by Internet (all major credit cards are accepted on-line). The fare is US$ 15 one way, by air-conditioned bus with comfortable seats, video, free water and snacks and WiFi. Thought night is usually not recommended for safety reason, we always had a good experience with Giant Ibis sleeper bus, and found it more comfortable than the "Universe Luxury" day bus. Other transportation companies should be used cautiously, as many accidents involve buses on the Phnom Penh to Siem Read “highway”... Avoid for instance the antique buses of Mekong Express and Rithy Mony. Angkor is a 20 minutes drive from central Siem Reap. You can get around the easiest way: by guided-tour in a comfortable AC bus. Though we didn't like this classical option, subject to large crowds (...of noisy Chinese tourists, the days of our visit...) and lack of options. Depending on how many temples are toured, the average cost is US$ 40 per day (excluding drinks and meals), 3-day ($40), or 7-day ($60). Private taxis and tuk-tuk (offering space for two, at US$12 per day) can show you around for a modest fee (US$ 30 – 50 maximum, excluding the US$ 37 one day entrance pass to the whole site). We tried in vain to rent a motorbike without a driver (only motorbikes with drivers can be arranged through hotels for very cheap US$6-$8/day), and therefore made it sportively riding bicycle form central Siem Reap (about 45 minutes on a plain, easy road)). US$ 1 per day was the price of our freedom: a good -and old- Baedeker guide in hand, a GPS in our pocket (download a map from Google Maps before getting there: it helps a lot). Don't hesitate to bring some spice to your exploration by riding elephants (available only on the route between Angkor Thom and Bayon). If you are not on a tight budget, fly Sokha Helicopters: a fantastic way to see Angkor and outlying temples like Boeng Mealea, Banteay Chhmar, or Koh Ker. Prices are more than reasonable, starting from US$110 per person for the basic 12 minutes tour. Booking is essential and shall be managed by your hotel without extra fee. Be an early bird,: the park starts operating at sunrise (5 AM). There are fewer visitors early in the morning, and the sun isn’t at full force. Arriving at the temples one step ahead of the crowds can make much difference during the high season. A visit in the afternoon is also a good alternative: too hot for many visitors, the temples are not overcrowded between 2 and 5pm. Then, tourists come back to enjoy the cinematographic sunset over Angkor Wat. Be extremely prudent with the sun: Bring a strong sun screen, wear a thick and large hat and DO protect your neck with a scarf (Cambodian scarves, which are smart souvenirs and gifts, are on sale in the Old Market). Purchase the excellent “Ancient Angkor” guidebook: available in any bookshops in Siem Reap, and hawked at every temple, it is surprisingly good. This is, with the antique Baedeker classic and classy guide books, one of the best alternatives to the local guides (most of them are OK, though their explanation could take long on some details which would only capture the attention of a Khmer art specialist). 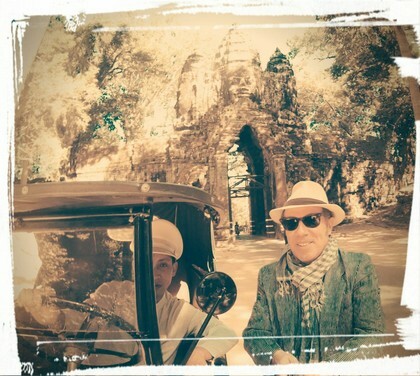 It costs next to nothing (between USD 100 and 200) to travel back in the good old time of the 1930s – 1960s Indochina, exploring Siem Reap and Angkor driven in style, in a vintage car. Initiated a decade ago by Victoria Angkor Hotel & Spa, one of our favorite lodgings in the city, this activity tends to develop, slowly yet surely. Discovering the ruins of the temples in a sputtering torpedo is something so unique, that words are not enough to describe our experience in one of the authentic, amazingly well kept Citroën cars, parked in from of the hotel. No need to stay at Victoria Angkor to hire them (at around USD 200 per half day, to be negotiated): the concierge can manage a tour for you, depending on availability. Just make sure that you book a few days in advance, and never forget that you need to purchase a pass to Angkor Park before your visit. You can do it the same day; but this would make you lose one precious hour, or more, standing in a queue. We embarked from the hotel, sat in the back of our rutilant bordeaux Citroën B14. Built in 1928, it has still its original “Made in France” engine. It looked like freshly imported from the “Quai de Javel, Paris” Citroën factory. Amazingly maintained, the 1.6L 4-cylinder 22Bhp engine started from the first attempt, with its signature “puff-puff” melody and some shakes from another time. A four seater, we recommend this car for a couple: because a large cool box, filled with Angkor Beer, Coca, fruit juice, and fresh water, occupies part of the back seat. Don't believe that you are the center of the locals and visitors' attraction: everyone is interested in your car! Its obvious popularity gave us the opportunity to have our picture posted hundreds of times on the social network... Married men visiting Angkor with their girlfriend might receive a unexpected "welcome" back home... This is the unique and marginal disadvantage of the amazing experience. We repeated it recently, with the Mercedes acquired by Hillocks Hotel & SPA. We love that place. It has it all for the spoiled traveler, looking for the best of everything. Beside a jeep, which can provide a nice off-road escape, two elegant cars proudly park in front of Hillocks: a contemporary beige Mercedes-Benz 280SE, from 1965, but still up-to-date, and an old lady, a black 190, from 1959. Both have been nicely reinstated. Purists may dislike it, but the original Mercedes engine has been replaced by a Toyota Crown, more reliable machinery. For one simple reason: it provides a much more powerfuk air-conditioning stream, for a comfortable ride. We logically didn't find this comfort in the Citroën B14: which was not a problem at all, as we are used to the tropical heat. Elder people, or those traveling with children, might consider AC, and the experience with the Mercedes by Hillocks has been tailor-made for them. We experienced both cars. The Mercedes 280SE is one of our favorite models. We missed a little bit the original sound of the German engine, but the W108 elegant line of the body is still here. The car is still wearing its 1960's perfume! 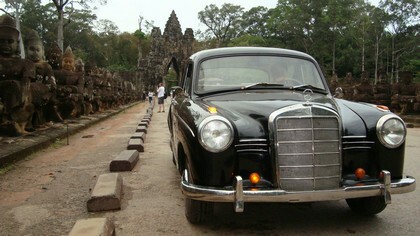 The deep seats are those of a limousine, and spending the whole day visiting Angkor in such a premium car was a real pleasure. Though our preference goes, of course, to the Mercedes 190. Again, we missed the antique sound of the diesel engine, but this is a black car, hard to cool under Cambodia blazing sun, and only a modern engine can do the job. Round shaped, with shining chromes, this car was already out-dated in the late 1950s... but so classy -and rare- nowadays. Imported from America, it provides more comfort than the models designed for the German market. The seats of the nicely beautified interior are smoother. Like the Citroën, our Mercedes was the center of attraction from part of the photographers. 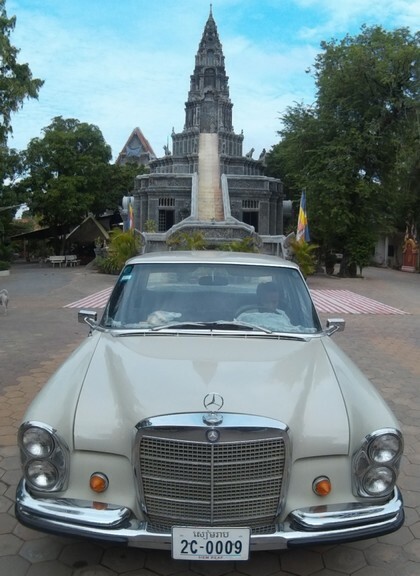 We would say that, besides the originality and comfort of the experience, the bonus of a tour by vintage cars are the pictures you can send to your friends, and keep as a souvenir of the best possible way (better than balloon or helicopter) to discover the temples. It provided us with an unforgettable image of Angkor, at a more than affordable price (little bit more than USD 100 per half day, negotiable, and always excluding the entrance fee to Angkor Park). 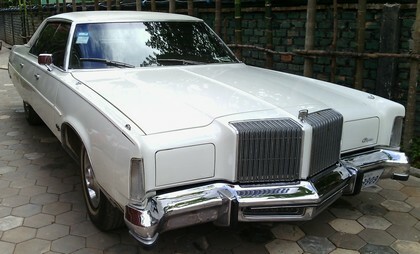 Most recently the Temple Group of Hotels imported a white Chrysler New Yorker Brougham 4-door sedan, 1975, with a powerful V8, and the characteristic “fuselage” distinguishing the 70s Chrysler cars from the competitors. The tours with this car are only available to those staying with Golden Temple, and the price was still under consideration during our last visit in winter 2017. It would be something like USD 200 per half day. Those nostalgics from the glorious 70s will love it, as the car is 100% original, and utterly comfy. A palace on wheels! Don't worry, you will survive the exploration at ease, even if you forgot to bring water and sandwiches. Soft drinks are hawked by stalls in front of practically every temple, at US$ 0.5 – 1 for 1 litre of cold water. We saw fat, wealthy tourists shamelessly bargaining; we didn't, as price is so reasonable and sellers so friendly... and hard working: staying at visitors' disposal from sunset until dawn, always with a smile. Dozens of small noodle and snack shops have sprung up near the major attractions of Angkor Wat and Angkor Thom. We found the food as simple as delicious, and surprisingly cheap in such a world famous tourist attraction: we didn't spent more than US$ 3, including a large glass of Angkor Beer, for a generous two course lunch, featuring grilled chicken and fresh mangoes... not even the price of a small bottle of water in front of the Eiffel Tower! 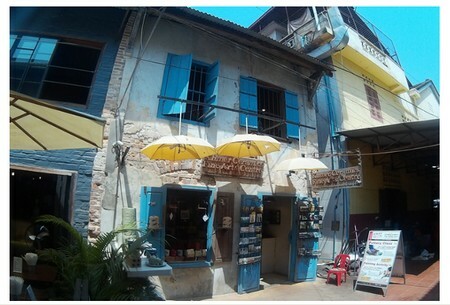 Those who find the noodle shops too basic can try the French restaurant “Chez Sophie”: an expatriates' hang-out, located just outside Angkor Wat main entrance. Rated as one of the best restaurants in Siem Reap, it features quite a high standard for US$ 7 – 20. Which is quite a lot in Cambodia, but cheap -and worth the visit- for Western travellers. Just for the anecdote, the French owner is the one and only foreigner living within the temple compound. Siem Reap is fantastic for its restaurants and bars atmosphere: back from Angkor, after a good shower and some rest in your hotel, take a tuk-tuk to the Night Market. Established in the former, carefully restored Old French Quarter, this is a concentration of bistros and pubs (lots of them with a street or roof-top terrace), where yummy French and Cambodian specialities are available at excitingly cheap price. French wine and liquors are four till five time cheaper compared with Bangkok. The service is young, friendly and efficient everywhere: staff looks so happy to serve you! The first evening should be dedicated to Koulen, booking a few days in advance via your hotel in this touristic restaurant, reputed for its excellent Khmer dances performances with live music. We found the buffet better than expected; if not over sophisticated, the local specialities available in huge quantity are really yummy. It gave us the possibility the most popular specialities of the Khmer cuisine in one night, for a few dollars (US$ 12). 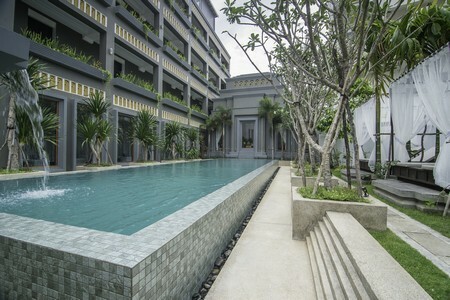 Couples and small group of friends may prefer the new Preah Peay, certainly more intimate and classy. Next day (s) you should definitely have lunch or, better, dinner in the Night Market / Old French Quarter area. We recommend the very kind Perk Sophal's “Khmer Kitchen” restaurant. This is where local peoples and expats like to invite their visiting friends. 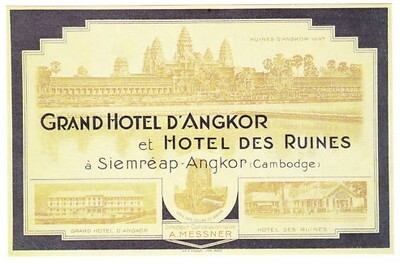 A favorite for Mick Jagger and Angelina Jolie who has a foundation in Cambodia (she also likes to dine at The Red Piano, which is not bad though too touristic nowadays): jet setters and anonymous visitors come for the coconut milk soup, the “fish amok” and the traditional Khmer vegetable curry. Very cheap (less than US$10 for two, plus a couple of dollars for two or three bottles of Cambodia Beer). Triangle BBQ Restaurant & Lounge-Bar is also one of the finest and coolest addresses in the Night Market district. It has a Khmer Show, not as popular as Koulen; but people mostly come there for the tapas-like specialities. The terrace is fantastic, with always a frantic and friendly atmosphere. Smoking isn't prohibited in Cambodia -one of latest free countries in this mad world!- and we could smoke our Cuban cigar peacefully, with a glass of Pastis 51 served exactly like in a Paris brasserie... at a portion of the European price (tax on imported alcohol is very low in Cambodia). Those options are ideal for your first day in Siem Reap. Foodies can discover more ambitious gastronomic resources checking our reviews of the best restaurants in Siem Reap. In Pub Street, we like to visit some of the Temple Massage parlours. They all offer clean, nicely designed rooms. The masseuses, in their 30 – 40s are all expertly trained. The oil, cream, and scrub lotions are guaranteed 100 natural. We have a slight preference for the Temple Massage located 2 Thnou St, almost next to Banana Leaf Pub. Essentially frequented by tourists, mainly from China, it is quieter compared with the other shops of the brand. Masseuses are poorly paid. Consider a tip. We recommend 5 dollars; more in the luxury hotels, where the younger masseuses catering Western tourists expect a 10 dollars tip minimum. We recommend Jaya House or Templation, welcoming upper-class travelers. High-end SPAs, catering tourists and the cream of the Cambodian society, were non-existing until the recent opening of the Kesor SPA. Located in the city center, not far from the Night Market, this is the ultimate destination to luxuriate, rejuvenate and relax both body and spirit. 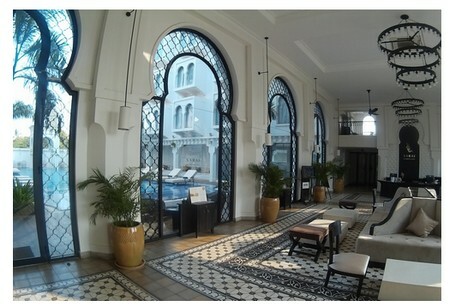 Supremely elegant, in a Khmer Art-Nouveau building designed by Vasia, one of the most celebrated architects in South East Asia, it boasts a palatial lobby with a view on the private pool which all clients can use before or after their treatment. It has open-air, pool-side massage beds, and also magnificent private suites, with stone-tub, and steam shower. We had a massage at Kesor SPA. Our masseuse has been imported from the luxury Golden Temple Retreat hotel. We experienced with her, for the first time, a “Hot Bamboo Massage”. This was extremely relaxing. Soothing our skin and muscles, it provides such a mental relaxation! We selected our favorite oil from a generous collection of bottles. It is guaranteed 100% natural. Such a treatment, in such a lavish place surprisingly only costs USD 35! Twice the price of a cheap, tourist massage parlor. But what a difference! Promotions are available all year long. We recommend this SPA to those looking for a very professional approach, and an actually effective treatment. Besides the recommended bamboo massage, the SPA menu is extensive. Kesor is also particularly indicated for couples (some suites have been designed for them), and would be a very nice gift for a honeymoon. You won't sleep in Angkor Archaeological Park, as this carefully protected area is of course exempted from hotels. Siem Reap has got plenty of resources, from dirty cheap guest houses to legendary high-end hotels and romantic boutique hotels (we have experienced and reviewed the best ones).